It’s ten minutes into the second period at the Xcel Energy Centre in Minnesota. The Toronto Maple Leafs are trying to win just their third game in their last eight showings, and at this point, things could go either way as the game has yet to see its first goal. Suddenly, Phil Kessel goes to support Roman Polak in a board battle, and while he thinks he’s come out with the puck, he’s actually done more harm than good. Nino Niederreiter strips it off of Kessel and chips it in, allowing Charlie Coyle to pick the puck up. Coyle throws it to the front of the net, Jared Spurgeon is there to redirect it in with his skate the puck goes past Jonathan Bernier to put Minnesota in the lead. That was Bernier’s first goal against in 2015. Unsurprisingly, it wasn’t the last. More surprisingly, though, it was the beginning of a wild ride and fall from grace throughout the calendar year. Twenty. Over the course of calendar-year 2014, only twenty goaltenders in the National Hockey League played at least 3000 minutes; or about 50 games, give or take some short nights and overtimes. 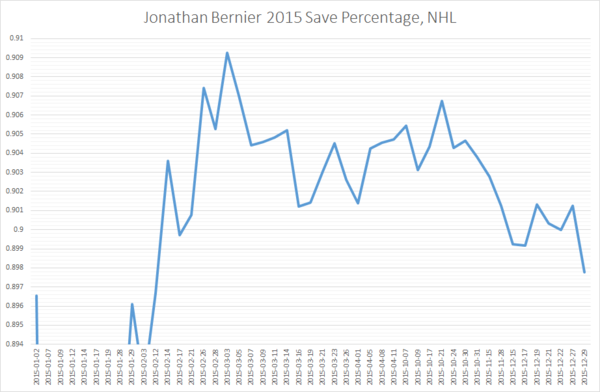 Of those twenty, Bernier ranked 10th in Save Percentage and 7th in Danger-Adjusted Save Percentage. Especially with James Reimer struggling at the same time, that was no reason to believe that Bernier wasn’t going to continue to be “the guy” for the team. For a while, it looked good. While the Leafs had their catastrophic and, to some people, expected fall from grace in 2013/14, Bernier seemed unphased, posting a career-high 0.922 save percentage over 55 games played. In his last 27 appearances of 2014, he didn’t appear to be slowing down. Despite being up against one of the more likable human beings the Leafs have ever had, Bernier won the hearts of Toronto with his stellar play, not to mention his ability to punch Ryan Miller in the face. But things began to fall apart for him once the fireworks hit. Bernier lost this game against Minnesota 3-1, and when he re-entered the net on January 7th, he had a different coach on the bench. Randy Carlyle, a man who had unwavering belief that he would be the team’s long-term goalie, was gone. Peter Horachek, moved from the assistants spot to the throne, took his place, and shook up the Leafs’ philosophies. Most notably, his 5/5/5 zone coverage system took the defensive emphasis from “try to make all shots against easy to track” to “eliminate shots against”. Common sense, really. As Wayne Gretzky once said, you miss 100% of shots that you don’t take, so any shot that doesn’t happen is attached to a save percentage of 1.000%. But when you’re a goaltender who has spent a year and a half being told that you’re the reliable backbone of the franchise, getting the game pulled away from your sights has an effect on you, even if its subconscious. Suddenly, the bad nights outweighed the good ones, and for the next month and a half, Bernier went 1-10-2, and found himself hovering around the 0.900 mark in that stretch; well below the 0.914 that goalies across the league were averaging. A win against Winnipeg on February 21st and a pair of 40+ save performances in the three games that followed seemed to put Bernier back in the right direction, bringing his 2015 save percentage to a more respectable 0.909. But the next game began a decline that he’d never dig out of. If you had to pick a point where Bernier’s starts to drop and never look back, it’s this goal by Nikita Kucherov on March 5th. It’s a heck of a snipe, but he wasn’t obstructed, had time to track Kucherov, and in typical fashion, this came on Tampa’s second shot of the game. Bernier ended up allowing three more goals that night, all off of long bombs; two of them going in without redirection or obstruction. This was the first of seven consecutive nights where Bernier gave up three or more goals and the beginning of a 1-9-1 run. Nonetheless, with Reimer not being much better in the present and statistically worse in the past, he kept getting the starts. The summer that followed added an additional element of absurdity to the saga. As Bernier inched closer to restricted free agency, people began to speculate whether the Leafs were going to restart their search for a long-term netminder. His wife inadvertently lit a match on the powderkeg a week before the draft by posting an Instagram photo of their son wearing a time-sensitive shirt which, for the first time in his young life, was devoid of Leafs branding. As it turns out, Martine was merely avoiding trademark issues for an upcoming Hockey Wives shoot, but before she knew it, the monster was unleashed. It didn’t help that her husband took forever to settle with the team. July 1st came and went, and the two sides eventually went the arbitration route. Despite his struggles, Bernier wanted $5.1 million; clear-cut starter money. The Leafs countered with a little less than three million, and in pursuit of a multi-year deal, the two sides met each other down the middle at $4.15 per for two years. It was a sensible risk on both ends; Bernier took less money to get security if he couldn’t rebound, and the Leafs had a potential two-year bargain if he panned out. It was short enough for both sides to get some gain and re-evaluate after. I don’t think either side, expected that what was coming next, though. While Mike Babcock suggested that he’d look at every player on the team with a clean slate coming in, he was initially very confident with giving Bernier the torch to start the year, even if Reimer had outperformed him during the preseason. It looked to pay off at first, in the sense that Bernier allowed two goals or less in three of his first four appearances. Granted, the games didn’t go the way the team wanted, in the sense that they lost all four showings, but it appeared that, game against Detroit aside, the Bernier everybody had faith in a year ago was coming back. The moment was short-lived, though. Bernier was pumped for five goals in his childhood rink, the Bell Centre, and the collective nerves kicked in once again. His next showing against the Rangers wasn’t bad; both goals allowed were cross-crease one-timers, and he was hung out to dry against the Penguins in the second game of a back-to-back. Tension was there, but nobody was ready to throw in the towel. Fast forward to November 15th. In this moment, collapse had turned to free fall. By this point in the year, Bernier was starting to feel the heat coming from behind him, as James Reimer spent two weeks doing what he normally does when played regularly and without concussion syndromes; he stood on his head, going on a 4-1-2 run where he was individually dominant on the stat sheet. In a game where Bernier had to prove himself, he gave up arguably his worst goal against of his career. He crumbled under the pressure of the crowd, the staff, and himself. As a dagger, Mike Babcock made it publicly known that he had blown his shot. 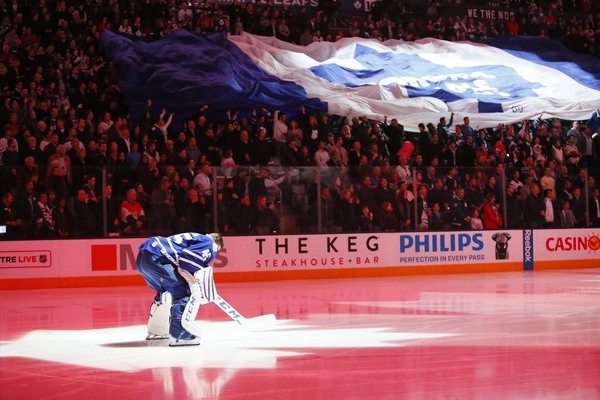 Knowing something had to change, the Leafs and Bernier came together and made the decision to have him spend four games down with the Toronto Marlies. When he got there, Bernier was encouraged to have fun and treat the experience like a vacation from the pressure; everyone knew what he was capable of and given the temporary nature of the assignment, he didn’t really have a spot to lose. Bernier thrived. He posted a shutout in his first game. Then he did it again the next game, and the next. His hometown fans gave him loud ovations to show they still supported him. For nearly two hundred minutes, Jonathan Bernier was as invincible as anyone had seen him since he got to Toronto; he just had to hold it together for one more game. Seven minutes in, he let in the first real opportunity that Utica threw at him. In the first two minutes of the second period, he gave up two more. His teammates gave him goal support, though, so he still had all the opportunity to come out with a 4-0 record. With a minute to go, he let in the tying goal. Sixteen seconds into overtime, he had lost. Twenty-six shots, five goals against. Oh, and this time, Leafs brass were watching him, and he knew it. Not the best way to finish your stint. After going back up, Bernier’s appearances were interesting. He gave up his first goal three minutes in, and allowed four more on his first night back, but still pulled the team into overtime. In fact, heading into last night, he had points in 5 of 6 games; finally ending his losing streak with a shutout against his former Los Angeles Kings. But after the Islanders chucked six pucks past him yesterday, many are once again wondering if they’ll ever see him succeed again in the long-term. Babcock has since confirmed that James Reimer will make his return from injury tonight. Heading into tonight, Bernier has a 0.898 save percentage over 47 starts in 2015; dismal compared to the rest of the league. Counting just the games played this season, he’s an 0.883; the worst in the National Hockey League. Mike Babcock confirmed seconds after this post was published that he’ll have one more opportunity to turn things around tonight. We’ll see how that goes. In a twist of fate, Bernier now finds himself in the exact situation that he was brought into avoid. The goaltender once brought in as the youthful hot-shot with pedigree and a tendency to play it cool is now 27-years old, has a reputation for allowing bad goals at bad times and has dealt with every moment of adversity in the worst possible way this over the course of this year. Without any of his original backers around to support him, Bernier has no room to feel complacent. Mike Babcock and Lou Lamoriello are results-driven bosses with no fear of making calls based on performance rather than intuition, meaning that any goaltender can place themselves on any position of the ladder. While it remains to be seen if Reimer and Garret Sparks’ injuries have affected them in a negative way, history implies that they won’t. Reimer does tend to struggle if he rushes back to the lineup before he’s ready, but only if the injury involves his head; this one is his groin, an ailment he’s had no problem recovering from in the past. An un-concussed Reimer is consistently near the top of the league in every performance metric, which we’ve seen so far this year. Despite turning on him at times, fan support has gone quickly in Reimer’s favour, and an unphased Babcock leaned heavily on him down the pre-injury stretch. The same goes for Sparks; while the team hasn’t confirmed what his lower-body injury is, a look at his history makes it easy to connect the dots, and if anything, Sparks has gotten better with every moment missed, as he uses the time off to add more technical elements to his play style. Realistically, Sparks will get sent down as soon as he’s activated off of IR for roster reasons, but his play during his call-up has made him a looming threat. The 22-year-old Sparks has put up above league average numbers in the ECHL (leading the league), AHL (near the top of the league), and NHL over the past year, leading some to believe he could handle a backup’s workload as long as injuries don’t get in the way. You wonder how much patience the Leafs will have with Bernier moving forward. It’s often suggested that a good Bernier would fetch a hefty trade return, but when names like Cam Talbot, Robin Lehner, Eddie Lack, Antti Raanta, and Antti Niemi moved around this offseason, they didn’t exactly garner big hauls. Just three goalies in the past four years have been directly traded for a first round pick; Semyon Varlamov, Cory Schneider, and Martin Jones. The former two were some of the highest-touted young goalies on the planet, and even then, the haul maxed out at a 9th overall pick. Bernier’s success might bring him from a conditional seventh to a fourth or fifth rounder, but for a competitive coach like Babcock, will be happy to oversee the dice-roll? With only a year remaining on his contract, placing Bernier on waivers followed by any cap overage being spilled over into Nathan Horton and Stephane Robidas’ LTIR exemptions might be a route that the Leafs seriously consider exploring. Whatever the case is, you have to feel for him. Professional athlete or not, paycheques be damned, it must be a real kick in the gut to start living out your life-long dream in the way that you planned, only for everything to start to fall apart. We all have those stretches in our life where nothing seems to go right, and this appears to be it. I doubt that there will be very many people in Toronto counting down the last ten seconds of 2015 as loud as him; though after that, it’s up to him figure out how to avoid continuing this tumble into the New Year. f*ck our lives. kessel will light is up since kulemin did last night. i hope he does and bibeau gets his first nhl start judging by last nights performance, it just might be possible.